Zanzibar Island is a part of Tanzania in East-Africa It`s an exotic, magical and wonderful Island, A real jewel in the Indian Ocean and still evoking an air of mystique and Arabian nights atmosphere with first class and unspoilt beaches and unrivalled tranquillity. Is is tropical paradise best characterised by it`s warm welcome and breathtaking beauty. Located in the Indian Ocean, about 25 miles off the Tanzanian Coast, It is peppered with stunningly beatiful beaches and translucent turquoise blue waters with fringing coral reefs which make for perfect diving expeditions. Rich in history, the fabled Stone Town provides a fascinating insight into the essence of Zanzibar and, of course, no visit to 'Spice Island' would be complete without a trip to the spice plantations. 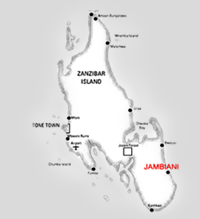 We are situated on the East-Coast of Zanzibar, between the village of Paje and Jambiani, It is 50km from Zanzibar Town / International Airport. It`s about 45 minutes drive. A beautiful, intimate place, Mbuyuni is perfect for those looking for relaxation on an Indyllic tropical Island with attentive services. Based in thatched cottages, the spacious, airy rooms are decorated in traditional Zanzibar design.